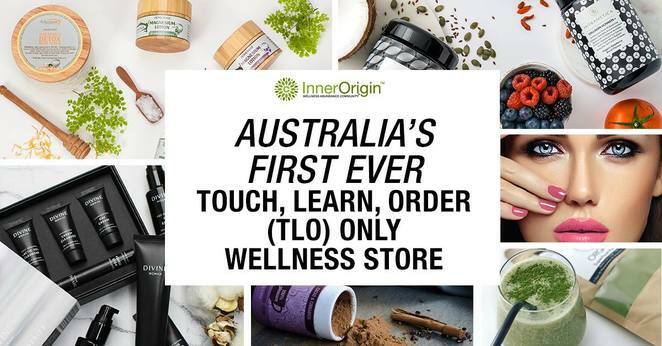 Introducing Australia's first ever Touch, Learn, Order (TLO) Only Wellness Store! Presented by InnerOrigin, an award-winning innovative, passionate wellness company, the TLO Only Wellness pop up store will be open over three exciting weekends on Sydney's Northern Beaches in January 2019. Launched just two years ago nationally as an e-commerce and advocate business, InnerOrigin is set to open its first bricks and mortar retail store. The TLO only wellness retail store invites customers to experience all the benefits of online shopping in an inviting offline setting. Discover and interact with InnerOrigin's Beauty & Detoxification Bar, Wellness Counter, Natural Makeup Studio and more. If you find something you like, simply place an order in-store and the product will be conveniently delivered to your door. Sally-Anne Ferguson, CEO of InnerOrigin, notes 2019 will provide an experience-driven concept, which will act a forerunner to permanent retail TLO stores across Australia - "After a year of market research, we have developed the TLO store model - touch, learn, order only, because we believe people want the convenience of online, but they miss the experiential pleasure and accuracy that in-store shopping provides. It provides the perfect 'best of both' solution for our customers." The first pop up will be opened at East Esplanade Manly, Sydney: Shop - Berrins, 2/40 East Esplanade Manly, Australia on January 5th 2019 and showcase the ultimate 'Wellbeing Edit', only the best quality, hand-picked wellness brands in food, beauty and health. "We are not an average wellness business. We are editing for the best possible products available in each category, products that are quality, natural, innovative and evidence-based. Our purpose is for customers to be able to shop knowing that we select the ultimate wellbeing range for them to choose from" says Sally-Anne. Customers will be invited to sample products under the direction of product experts at no expense with no purchase necessary. "It's the ultimate wellness experience for you and your friends" says Sally-Anne Ferguson. "It really is an incredible and convenient way to shop, and perfect also for those who are inspired to learn more." Interested shoppers can join in one of InnerOrigins in store "WellShops", their version of a workshop. These WellShops are educational, hands-on opportunities to experience these products and learn all about their creation, led by the likes of wellness speaker Therese Kerr. "We inspire, educate and connect people to wellness which we believe are the important foundation stones of the wellbeing industry." shares Sally-Anne. InnerOrigin intends to expand its operations to become a full omnichannel retailer. Selling online, via social media, in-home personal shopping experience via an independent advocate and retail, with plans to open three permanent Touch Learn Order only, Flagship retail stores during 2019, with only one in each of Sydney, Melbourne and Perth. "In a time when many retailers are struggling with the cost of rent and overheads, and online retailers are looking to bridge the gap to engage physically in person with their customers, we believe that our TLO retail stores are the solution to both challenges, and are the exact experience customers want" said Sally-Anne. Come and visit Australia's first Touch Learn Order (TLO) Only wellness pop up store at Berrins 2/40 East Esplanade, Manly NSW 2095 on the weekend of 5 & 6 January; 12 & 13 January; and 19 & 20 January 2019. The store will be open from 9am to 6pm and entry is FREE. On various days, InnerOrigin supporters will be in-store, for example Layne Beachley, Therese Kerr, Kirk Pengilly and Pete Evans. Follow the InnerOrigin Facebook and Instagram to find out more.